This week is key for getting your Thanksgiving needs met through the CSA. Order Milk Not Jails by tomorrow (11/10) for delivery on November 20th. Find all the info you need here. Lewis Waite turkey orders must be placed by this Friday (11/14), and some of the varieties have already sold out. You have until Monday 11/17 to figure out what else you may need to complete your feast, with delivery on Thursday, 11/20. Everything you need to know is here. We’re also selling tickets to win a Lewis Waite turkey, so bring money to this Thursday’s pickup. The winner will be announced before the deadline to order. If you’re looking for a turkey recipe, I’ve made this the past few years and it’s pretty foolproof. Plus, no advance prep like brining, which I always find challenging in my 3/4 size apartment refrigerator. Instead of canola oil I will use rendered leaf lard from pastured pork, which can be ordered from Lewis Waite. Don’t be scared, rendering lard is simple and easy and all you need is a dutch oven, a mesh strainer, and storage containers. I’ve successfully subbed arrowroot for the cornstarch, one for one. Line medium bowl with several layers of paper towels. Spoon ricotta cheese into bowl. Let drain at least 30 minutes and up to 1 hour. Rough chop broccoli florets and stems. Drop into boiling salted water and cook until just tender. Drain. Place drained broccoli into food processor and puree. Beat egg, cheese, salt, and pepper in large bowl to blend. Mix in ricotta and pureed broccoli. Sprinkle 3/4 cup flour over and stir gently to blend. Cover and chill dough 1 hour. Can be made 1 day ahead. Keep chilled. Line rimmed baking sheet with plastic wrap. Place some flour in bowl. For each gnudi, gently roll 1 heaping teaspoonful of dough into ball. Add to flour; toss to coat lightly, shaping into short log. Place on baking sheet. Can be made 4 hours ahead. Cover; chill. Cook gnudi in large pot of boiling salted water until very tender, about 8 minutes. Drain. At this point, you can top them with sauce of your choice, such as tomato, or place them in a baking pan, pour over the sauce recipe that follows, dot with 2 oz. of butter cut up in small pieces, and pass under the grill a few minutes to brown the top. Melt the Parmesan and Provolone in the cream over low heat, until melted. Season with salt & pepper. Wash chopped leek well in a bowl of cold water, then lift out and drain well. Peel potatoes and cut into 2-inch pieces. Cover with cold water in a saucepan. Bring to a boil, then reduce heat and simmer, uncovered, until potatoes are tender, about 18 minutes. Drain and return to saucepan. While potatoes are simmering, cook carrots in a 1- to 1 1/2-quart saucepan of boiling salted water until just tender, 5 to 6 minutes, then drain. Trim hard knobs, rough ends and dirty bits off ginger. Coarsely chop it by hand with knife then mince it in a food processor. Add carrots and process again until fairly smooth. Cook leek in butter in a 10-inch skillet over moderately low heat, stirring occasionally, until very tender, about 6 minutes. Add milk, salt, and pepper and simmer, stirring, 2 minutes. Add leek mixture to potatoes and coarsely mash with a potato masher, then stir in the carrot puree. Note * – Other veggies can be pre-cooked and added to the mash (rutabaga, turnips, cabbage, etc.). Other herbs and spices can be added (cumin, fresh thyme, etc). Roasting the butternut squash brings out its natural sweetness and adds depth of flavor to the soup. The sage brings in notes of late autumn while the pear reminds us that it’s not quite time to dig out the flannel pajamas yet. Curiously, this soup tastes a lot like a pierogi – so side bonus for anyone with a hankering for his or her baba’s home cooking. 1. Heat oven to 425°F. Add 1 cup of water to a large casserole dish and lay butternut squash on top, cut side down. Bake for 30-45 minutes until squash has softened. Set aside to cool. 2. In a large pot or Dutch oven, heat butter over medium heat. When butter begins to sizzle, add leeks and pears to the pot and cook, stirring occasionally for about 7 minutes or until leeks have wilted down and are just beginning to get golden. Meanwhile, scoop the butternut squash out of its skin. 3. Add sage and savory to the pot and sauté with the leeks and pear until fragrant, about a minute. 3. Add chicken stock and butternut squash to the pot and turn heat to medium-high, stirring and mashing squash with the side of your wooden spoon to break it down into smaller chunks. As soon as the liquid begins to bubble rapidly, lower heat to medium-low and simmer for 15 minutes, stirring occasionally. 4. Turn off the heat and season with salt and pepper. Let the soup cool at room temperature, then working in batches, blend the soup. Cook peeled and cut-up turnips and sliced garlic in olive oil in a large skillet until tender. Add the turnip greens and cook until just wilted. Season with salt and pepper and a squeeze of lemon juice. Peel and cut turnips into wedges. Toss with sliced fresh ginger, canola oil, salt, and pepper on a rimmed baking sheet. Drizzle with honey and roast at 400° F until tender. Simmer peeled and cut-up turnips in boiling salted water until tender. Drain and mash with butter, salt, and pepper. Fold in crumbled cooked bacon and chopped chives; top with shaved Parmesan. Cook thinly sliced leeks in butter in a large saucepan until soft. Add peeled and cut-up turnips and enough chicken broth to cover. Simmer until very tender. Puree until smooth, adding water or broth as necessary to adjust the consistency. Season with salt and pepper. I have been a member of the Sunnyside CSA farm share for four years now. Taking part in a farm share is a wonderful, exciting, and adventurous endeavor, but it can also be overwhelming at times. More often than not you just don’t get around to cooking all those veggies! I always feel like such a failure when I have to throw away an overlooked vegetable in my fridge. For this first installment, I have come up with several ways to make sure you are getting the most out of your CSA. Thursday night is a busy evening in our house. I usually take my 3 year old with me to pick up my farm share around 5 and then we grab a quick pizza for dinner. I put each veggie in a separate plastic grocery bag and then place them in my fridge or on the counter, depending on the storage tips from Golden Earthworm. On Friday I start to make a meal plan as I sip my morning coffee. I start with the contents of my box and design a meal plan to use all the ingredients. If there is a lot of cabbage in the box, then I might design tacos with a cabbage chipotle slaw. If the box is loaded with zucchini, then shredded zucchini pizza, pasta with zucchini, or a zucchini quiche. 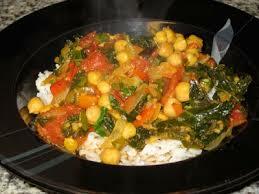 I seem to get a lot of swiss chard so I routinely plan on making Moroccan chick pea stew and chard stew over couscous. Then I head to the grocery store to get the rest of what I need. Depending on the week, I might prep my veggies on Saturday. That way I am all set for the week! But of course there are other weeks – especially in the summer – when life is too crazy to get to all that meal planing and cooking. Stay tuned for some time and money saving tricks for those busy weeks coming up in my next post! A rustic homage to late summer produce, this recipe is incredibly flexible and can be customized to whatever the season’s harvest (or trip to the grocery store) has brought to your kitchen. For a vegan/vegetarian version, substitute the chicken with largely diced oyster mushrooms or simply omit the chicken! 1. Heat 1 Tablespoon of olive oil in a large Dutch oven (or large, heavy skillet) over medium heat. Add chicken and brown, about 3 minutes each side. Transfer chicken to a bowl and set aside. 2. Add remaining 2 Tablespoons of olive oil, onion, leeks, and garlic to the pot and cook, uncovered, stirring occasionally for about 5 minutes or until onions start to become translucent. 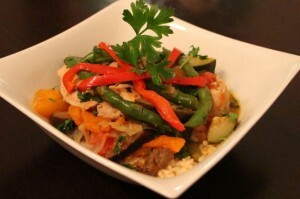 Add the red long pepper, green bell pepper, and zucchini and cook 5 minutes longer. Transfer at least half of these vegetables to the bowl with the chicken. 3. Add eggplant to the pot and cook 5 minutes or until eggplant begins to turn golden. Add heirloom tomatoes, basil, oregano, thyme and celery seed. Bring to rapid simmer, then lower heat to medium-low and cover. Simmer for 10 minutes. 4. Add chicken and reserved vegetables back to the pot. Cover and simmer additional 15 minutes, until chicken is no longer pink and is beginning to fall away from bone. 5. Add green string beans, stirring them in and cooking until they become vibrant green, about 3 minutes. Season with salt and pepper then (being careful not to burn your tongue!) taste to make sure it’s to your liking. 6. If you don’t need to thicken the mélange (see note below), you’re ready to serve! Garnish with the fresh parsley at serving time. Serving suggestion: Serve over rice or egg noodles, though any cooked whole grain accompaniment will work nicely. You can also serve with a hearty whole-grain bread or crusty French baguette. If your tomatoes are extra juicy and the finished mélange is too soupy for your taste, combine ¼ cup water with 1 Tablespoon all-purpose flour in a cup and whisk until combined (this is a “slurry”). Pour the slurry into the still bubbling pot and simmer over medium-low heat while stirring constantly until mélange has thickened; this will take a minute or two. *To quickly peel the tomatoes, score a large “X” on the bottom of each then immerse in boiling water for 30 seconds. Remove tomatoes from boiling water with a spider and plunge into a bowl filled with cold water (straight from the tap is fine). The skins should slip right off! Find the rest of the recipe here.